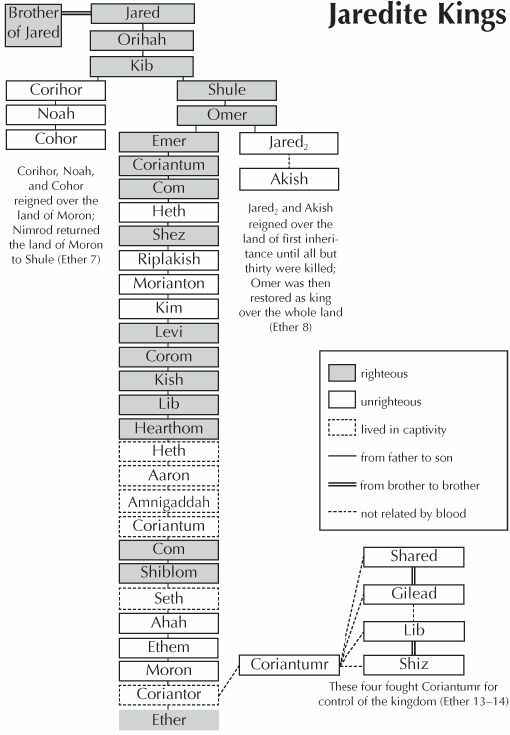 This chart shows the chronology of Jaredite kings referred to in the book of Ether, their familial ties to each other, and whether they were righteous, unrighteous, or in captivity all of their days (in which case their moral character went unremarked). Mosiah attested to the ability of a king to influence his people for good or evil. Referring specifically to King Noah, he stated, "How much iniquity doth one wicked king cause to be committed, yea, and what great destruction!" (Mosiah 29:17). The main column on this chart gives the genealogy of Ether, the son of Coriantor (see Ether 11:23), which runs back to Jared (see Ether 1:6–32). This king list contains thirty names, from the Jaredite founder down to the prophet Ether, who was not a king but whose name is on the book in the Book of Mormon telling the history of the Jaredites. Conflicts with others who asserted powers as kings are also listed.